Brian W. Stack is managing director of CIE Tours International, one of the largest producers of tourists to Ireland, Scotland, and many other areas of Europe. 2013 marks the 82nd anniversary of CIE, and is also the company’s most successful year to date. He is also president of the Ireland-U.S Council for Commerce and Industry. In both these positions, Brian is at the forefront of promoting closer connections between Ireland and the U.S.
Born in Dublin, Brian developed a knack for travel at an early age, vacationing with his family all around Europe. He joined Aer Lingus, Ireland’s national airline, in the 1960s working in every aspect from airport and cabin service to reservations. He eventually became a sales manager for Aer Lingus and relocated to England. Later, he joined the Irish Tourist Board based out of New York, and then moved to Florida where he worked for the Ocean Reef Club for six years prior to joining CIE in 1990. 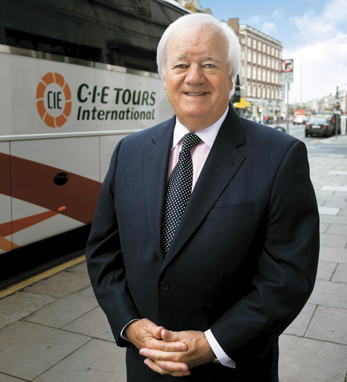 He has served as chairman of the United States Tour Operators Association, was president of the Society of Incentive Travel Executives, is vice chairman of the Irish American Cultural Institute, and is president of the Ireland-U.S. Council for Commerce and Industry. His awards also include “Man of the Year” from the Incentive Travel Industry and “International Executive of the Year” by the World Congress on Marketing and Incentive Travel, in addition to previously being honored in the Top 100 Irish Americans by Irish America. Brian resides in New York with his wife, Anne-Marie and they have two grown children.